General Dynamics Corp.’s GD Electric Boat division recently secured a $480.6-million modification contract for Columbia-class fleet ballistic missile submarines. The contract was awarded by the Naval Sea Systems Command, Washington, DC. Per the terms of the contract, General Dynamics will conduct advance procurement and construction of its lead ship, for the fiscal years 2019 and 2020, to support the Columbia-class fleet ballistic missile submarines. Work related to the deal will be performed in Quonset, RI; Newport News, VA; and Groton, CT. The entire task related to the deal will be subsumed into the lead ship construction contract in October 2020. The Columbia-class submarine, which is currently positioned to take over the role of submarine presence in the United States’ strategic nuclear force, is being designed to replace the existing Ohio-class ballistic missile submarines. Each submarine will have sixteen missile tubes, carrying one Trident II D5LE missile. The submarines will be 560 feet (170.7 m) long and 43 feet (13.1 m) in diameter (as long as the Ohio-class design and one foot larger in diameter). General Dynamics enjoys a dominant position as a Navy contractor, with the company being one of the only two contractors in the world equipped to build nuclear-powered submarines. The United States is strategically strengthening its naval power by upgrading missile submarines as widespread geo-political tensions loom large, which, in turn, benefit defense contractors like General Dynamics significantly. In fact, the company boasts a successful history of acquiring major contracts for its ships and nuclear-powered submarines. Evidently, during the second quarter of fiscal 2018, the U.S. Navy awarded General Dynamics with a $225-million contract for Block V Virginia-class submarine long-lead materials alongside a $100-million deal for advanced nuclear plant studies in support of the Columbia-class submarine project. Consequently, its Marine System segment, which builds nuclear-powered submarines and surface combatants, generated revenues of $2,168 million in the second quarter, reflecting 4.3% year-over-year growth. Thus, we may expect the latest contract win along with the aforementioned delivery contracts to add more impetus to this unit’s growth in the days ahead. Furthermore, toward the end of June this year, the U.S. Senate approved the fiscal 2019 defense budget that provisions for major war fighting investments worth $18.4 billion for shipbuilding. Interestingly, the budget included an investment plan of $7.4 billion for two Virginia-class submarines and a plan of $6 billion for three DDG 51 Arleigh Burke-class guided missile destroyer program. We expect General Dynamics to be a significant beneficiary from the aforementioned budget, being a prominent shipbuilder in the United States, which, in turn, is likely to boost its profit margin, going ahead. General Dynamics’s stock has gained only 0.5% in the last year compared with its industry’s growth of 23.6%. The underperformance may have been caused by intense competition that the company faces in the aerospace-defense space. General Dynamics currently carries a Zacks Rank #3 (Hold). A few better-ranked stocks in the same sector are Aerojet Rocketdyne Holdings AJRD, Engility Holdings EGL and Huntington Ingalls Industries HII. 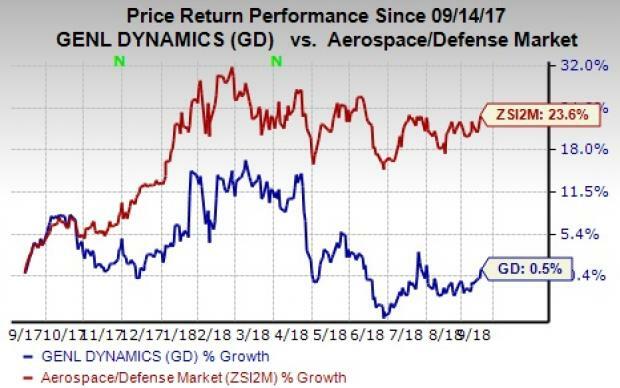 While Aerojet Rocketdyne sports a Zacks Rank #1 (Strong Buy), Huntington Ingalls and Engility carry a Zacks Rank #2 (Buy). You can see the complete list of today’s Zacks #1 Rank stocks here. Aerojet Rocketdyne came up with an average positive earnings surprise of 9.27% in the last four quarters. The Zacks Consensus Estimate for 2018 earnings has risen 30.9% to $1.27 in the last 90 days. Engility Holdings delivered an average positive earnings surprise of 19% in the last four quarters. The Zacks Consensus Estimate for 2018 earnings has moved up 16.1% to $2.02 in the last 90 days. Huntington Ingalls pulled off an average positive earnings surprise of 9.48% for the trailing four quarters. The Zacks Consensus Estimate for 2018 earnings has moved 6.4% north to $17.24 in the last 90 days.